You see “Pinterest” and you’re about to leave this page. Don’t do it. Pinterest is not just for recipes, crafts, or home decorating. 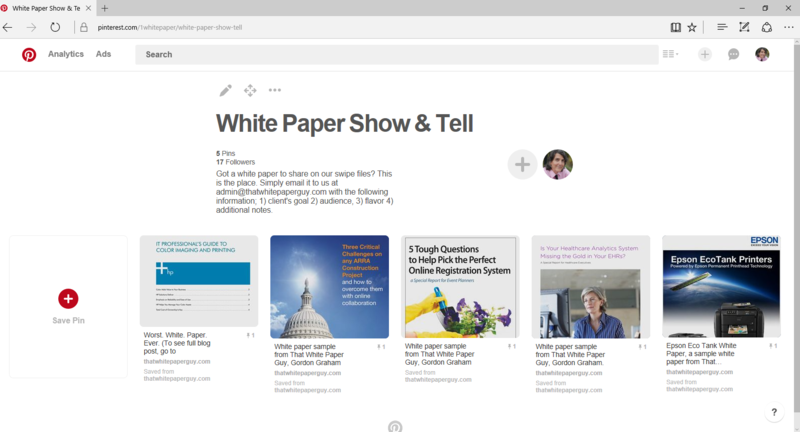 We think Pinterest is the perfect place to show off B2B white papers. That’s why we started our own Pinterest board here. And this post explains what we’re doing, and why. But Pinterest is really a visual bookmarking platform where users create collections on boards. Think of it as an online bulletin board. That’s what attracted us. We were looking for the best place for an easy-to-search collection of the 100+ articles on That White Paper Guy’s website. After reviewing many possibilities, we picked Pinterest. 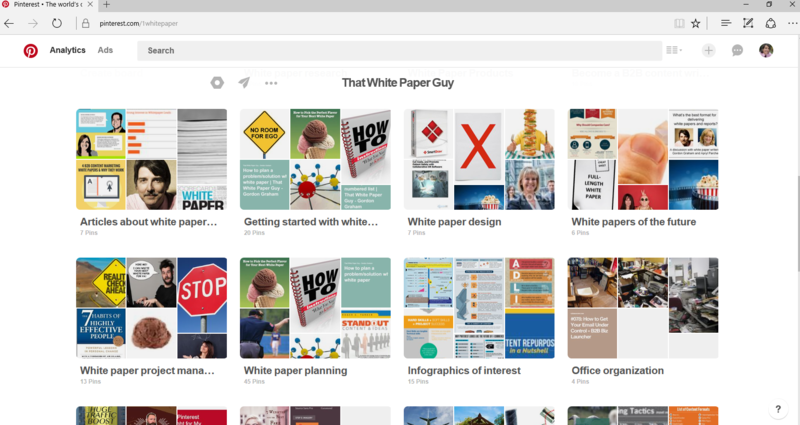 We believe Pinterest is a great place for writers and companies to promote their published white papers. It’s simple, it’s free, and it’s accessible 24/7. The big reason we’re using Pinterest is for an online “swipe file” we could share with you. As you may know, a swipe file is a collection of examples that you think are especially well done. Many writers and designers keep personal swipe files stored on their computers or printed out in binders, anywhere they can get quick inspiration when they need it. In his book, White Papers for Dummies, Gordon Graham talks a little about swipe files. “Swipe files are perfect for getting inspired yourself, or to show clients or designers when you’re developing ideas,” he says. And remember, using a swipe file isn’t stealing; it’s research. You don’t copy straight out of a sample in your swipe file. Instead, you use it to see how another writer or designer covered some topic or handled some issue. “This is one case where imitation is the most sincere form of flattery—as long as you don’t plagiarize a whole chunk of a text,” says Gordon. We want you to contribute to our Show and Tell board! If you’ve written or produced a white paper you’d like to share, please e-mail the link to us at admin@thatwhitepaperguy.com. What was the client’s goal for the project? What flavor is this white paper? Any added notes you feel are important. We’ve already pinned a few sample white papers, and we’ll be adding more regularly. You can find all the information we requested above in the comments below each pin. You can offer input or ask questions in that section as well. We’ll also check in to offer comments on white papers submitted by you. You will have to sign up for a Pinterest account to access our boards (or anyone else’s). If you’re already signed up, click on this link to access our Pinterest page. Be sure to FOLLOW us to keep up-to-date on what we’re pinning. Once you have an account, you can create your own boards and start pinning. And you can repin anything in our collection on to your own boards. That way, you can start your own personal white paper swipe file! Plus, we’ll have a pin for every article on our site. And, we’ve linked to our online courses and products, and to free stuff like our ice cream report, How to pick the perfect flavor for your next white paper. We’ll also be pinning links to other articles and websites we feel are valuable to anyone involved in creating white papers or other B2B content. Pinterest is one of the fastest-growing social media networks, with 150+ million people around the world using it every month. It’s been growing steadily since 2010 when it had just one million users. Women use it most. Men are starting to see its benefits and account for 40% of new signups these days. 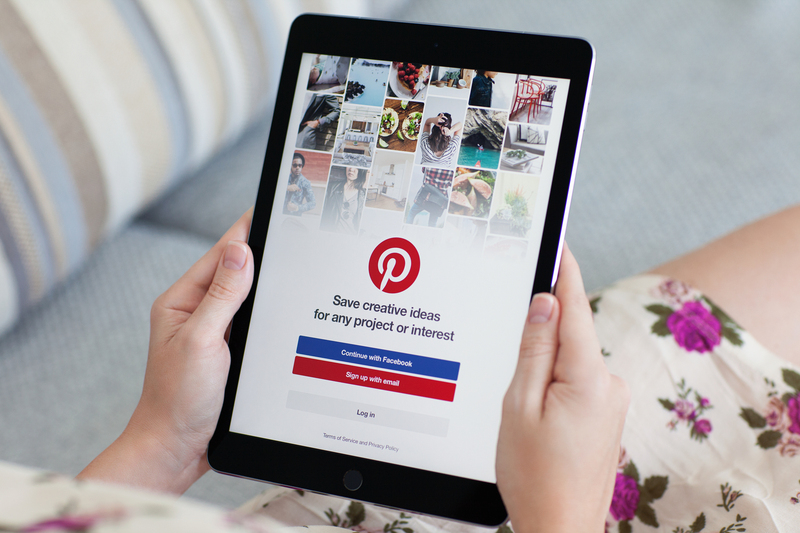 Two-thirds of Pinterest users are under 40, making this an ideal place to reach up-and-coming writers, designers, and marketers. These stats are from this article at Social Draft, which says Pinterest is now one of the top drivers of traffic to websites. We already see how Pinterest can drive traffic, and we’ve barely begun to promote our Pinterest boards. Pinterest is a relatively new network for B2B writers and marketers but it’s definitely one to watch. Some of the companies we’ve already found—and started following on Pinterest—include AWAI, Hubspot and Marketo. We want to inspire you as a B2B writer or marketer, particularly if you’re involved with white papers. We want to provide you with the best advice and tools to be successful with your white paper projects. That’s why we intend to make our boards a great resource for anyone planning, writing, or designing white papers or other B2B content. That link again: Click here to see That White Paper Guy’s Pinterest boards. Take a look at our Pinterest boards and let us know what you think. And be sure to tell us how Pinterest works for you.